Many of the ideas for my columns come from discussions I have had on Twitter throughout the week. So, thanks to @Marty_Leap53 and @NotArtVandelay for this week. Ryan Malone, Max Talbot, Jarkko Ruutu, Gary Roberts, Georges Laraque, Matt Cooke, Eric Godard, Billy Guerin... the list goes on and on. When you have two of the game's best on your team, there is usually an amount of toughness on the roster to compliment and protect those players. Bylsma's style relies heavily on a strong forecheck, knocking the opponent off of the puck so the other players in the zone can create offensive opportunities. Ever since the Michel Therrien era with these Penguins, Shero has constructed the team to be hard to play against physically, and this was the one area, maybe the only area, where Therrien and Bylsma's philosophies overlapped. If you watch any Michel Therrien press conferences, the terms physical or aggressive come up almost every time. "It's going to be important for us to be physical." "We want him to be aggressive." When the team was lacking these attributes, like back in 2006, he called them out saying, "I think their goal is to be the worst defensive team in the league...They're soft." 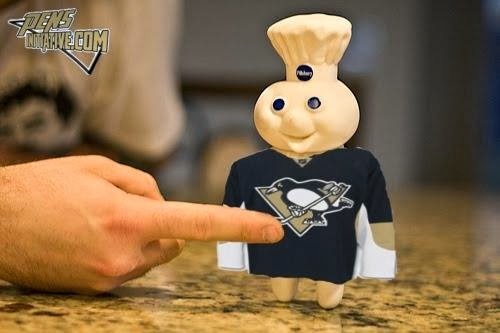 Ever since that time, the Penguins have been difficult to play against physically. Even before Dan Bylsma brought in his high-tempo offensive scheme, the Penguins' would punish people with hard body checks. They would agitate teams with players like Ruutu, Talbot, or Cooke. It is something that is built into the team's - and the Steel City's - DNA. Bylsma on the other hand is famous for saying that the Pens need to get to their game. What exactly is their game? His offense emphasizes the forecheck and offensive zone control. He applauds and encourages his defensemen to cheat down low, having the "F3" forward cover for them. 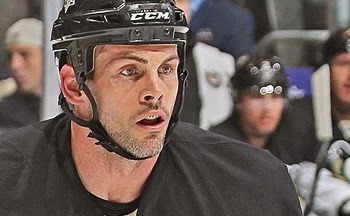 No matter if it is a defenseman or a forward, the goal is to be physical and check the opponent off of the puck to free up space on the ice for the Pens' offensive talent. The Penguins did bring in Jacques Martin this year to get a more defensive mindset, but let's not kid ourselves here. This is still Dan Bylsma's team, and the philosophy will generally remain the same of 'wearing teams down' for the first two periods to have it pay off in the third. The real question is, the way this team is currently constructed, can they still do these things? The Pens' offseason was a long one thanks to their embarassing exit from the Conference Finals. It left Ray Shero to answer some tough questions. Can we sign Malkin to a long-term deal? Should we sign Kris Letang to a long-term deal? With role players and main contributors like Pascal Dupuis, Matt Cooke, Brendan Morrow, Jarome Iginla, and Douglas Murray all free agents, who can and should we bring back? When Shero made the decision to sign Evgeni Malkin AND Kris Letang to long-term deals, it effectively locked up almost 40% of the Pens' salary cap into three players and severely limited what role players the team could retain. So Shero made his decision to keep Dupuis and let Cooke, Morrow, Iginla, and Murray go. The Pens will be returning all of their hits leaders from the 2012-13 season. Tanner Glass, Brooks Orpik, Craig Adams, and Chris Kunitz all remain in Pittsburgh with 125, 119, 107, and 104 hits respectively in the shortened season last year. Unfortunately with Cooke, Murray, Morrow, and Iginla gone to free agency, the team lost 97, 89, 85, and 65 hits respectively. The Pens had a total of almost 1400 hits last season, and while they return most of their leaders, they've given up almost 25% in the four players lost. And so, here is where the problem lies. Many fans do not want Craig Adams or Tanner Glass in the lineup (myself included on Glass) because the young guys need a chance to play. If I take my best guess at the 3rd and 4th lines of the Penguins without these two, it would look something like Jokinen-Sutter-D'Agostini on the third line, and Vitale-Jeffrey-Kobasew on the fourth line. These six players in TOTAL last season accounted for 153 Hits. The six played a total of 201 games, which averages at .76 hits per game. Glass and Adams played a total of 96 games with 232 hits, which averages out to 2.43 hits per game. If one or both of these two do not play for the Penguins, where do these hits come from? The first and second lines for the Penguins will continue to do what they do each season. They will dominate the league with skill and talent. However, cups are won by having a balanced lineup. In the Stanley Cup winning season of 2008-09, the Pens deployed arguably the best third line in hockey. Matt Cooke and Jordan Staal were among the top 25 forwards for the NHL in hitting that season. They wore teams down and made things easier for players like Crosby and Malkin to operate. This season the coaching staff needs to ask themselves whether they will start to play young, less physical players to give them some experience and change their approach to games, or whether they will stick with savvy veterans like Adams and Glass and continue their approach of wearing teams down. Even with Adams and Glass in the lineup, the team's hits will be down this season, and the lineup as a whole will be "soff"er than we have seen in years past.